What do you do if you’re a creative who just lost your job? Start a Tumblr blog to get a new one of course! This is exactly what a group of recently laid off employees of Omnicom Group’s Goodby, Silverstein & Partners (GSP) did after losing their jobs in a recent round of cuts made by the ad agency. GSP reportedly laid off as many as 200 of its 700 staff this month after losing key accounts Sprint and Hewlett Packard. 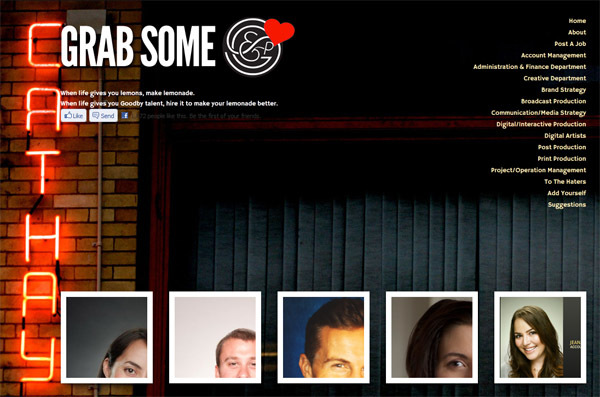 GrabsomeGoodby.com, which was created by J.D. Beebe, encourages the laid-off workers to advertise their experience to agencies and recruiters, as well as providing a portal for companies to load job openings. Staff are listed on the site under their areas of expertise which range from account management and strategy to creative and production. At time of publishing the site had 1072 likes on Facebook.